I was excited when I found out my son would be taking snacks to school the day before Thanksgiving break. I searched Pinterest for ideas, hoping for something relatively healthy, easy to transport, and not terribly complicated or expensive. 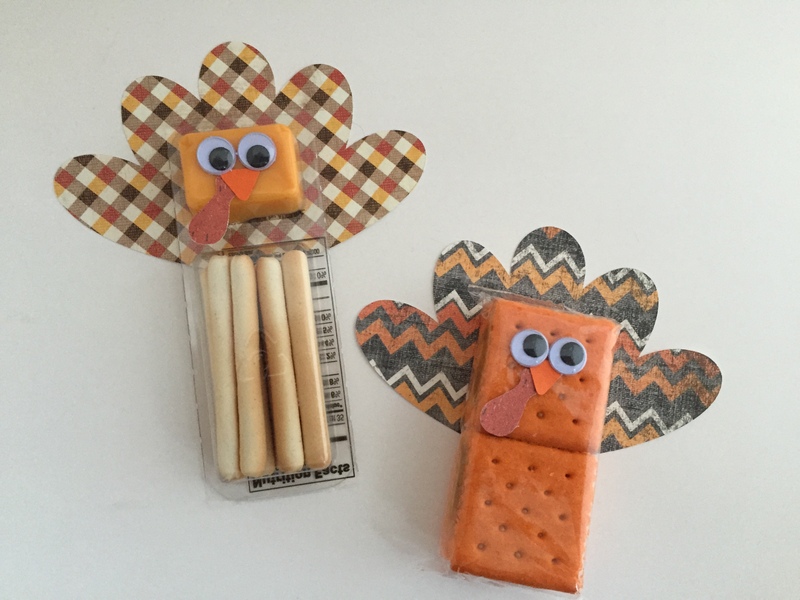 When I found this pin for some crackers decorated like turkeys, I knew I was on the right track. I used my Silhouette Cameo to simplify the paper cutting. This Turkey Pillow Box shape has a great face and tail feathers. Aside from the crackers, all I needed were 3-12" fall patterned papers for the feathers, a sheet each of red and orange for the face, and some googly eyes (I splurged on stick-on ones so the kids could easily help). I used a glue stick to attach the paper shapes, and ended up with a super-cute Thanksgiving snack. Cute, easy & cheap — I love it! 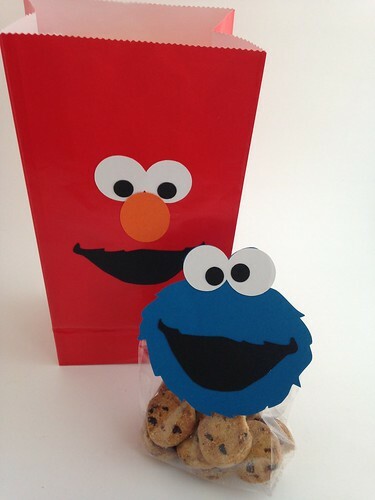 We had a small Elmo-themed birthday party for my daughter's second birthday this past weekend. I'd planned to share a tutorial here on how to make a polymer clay cake topper... but that topper didn't quite make the cut. So instead I'll share some of the other fun decorations and activities we came up with. It seems like such a long time ago that I reviewed my first Christi Friesen book. That was before I met her. That was before I became one of those folks who wouldn't pass up an opportunity to take a class — any class — from her. Christi is probably the best teacher-of-adults I've seen. She manages a classroom full of creatives amazingly. She's generous and encouraging. And her classes are just plain fun. And because I've gotten to take some of her classes, Christi's latest book was especially enjoyable to me. 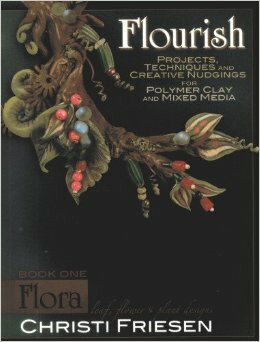 It's got a mouthful of a title: Flourish: Projects, Techniques, and Creative Nudgings for Polymer Clay and Mixed Media: Book One: Flora: Leaf, Flower and Plant Designs . But you could shorten that title to A Christi Friesen Class in a Book, because that's what it felt like reading it. Her conversational tone in the book meant I could just about hear her chatting away. The pictures of her, sprinkled throughout the book, made it feel like she was right there guiding me as I learned. I was sad to learn that my favorite local rubber stamp store was going out of business after many years. Admittedly, I hadn't visited much lately, but I'd sent many folks their way... and I just liked knowing they were there. So on their final week, I had hubby watch the kiddos while I shopped their 75% off sale. I was thrilled to get to stock up on some new colors of alcohol inks, and I found some fun new stamps. 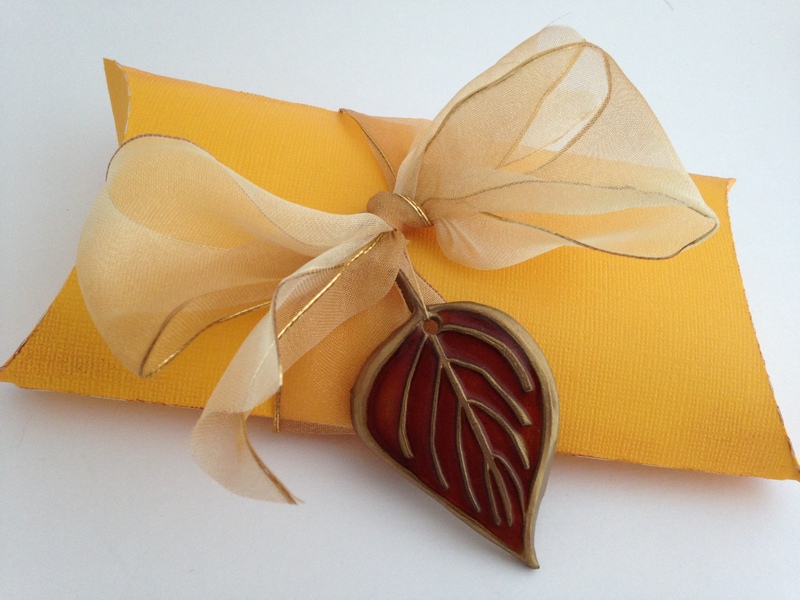 I decided to combine those finds to make some pretty autumn leaf pendants in the style of Isabelle Ceramy-Debray's faux enamel from Polymer Clay Beaded Jewellery (reviewed here). My pendants are actually serving multiple purposes here: I'm using them to decorate some autumn gift bags and pillow boxes, after which the recipients can string them onto a necklace of their choice. I hope this new year finds you working on all sorts of wonderful things! Between late-night feedings and diaper changes, the main thing I've been spending my free time on is preparing for the OKPolyClay Twisters Retreat, which my local guild will be hosting April 19-21, 2012, in Norman, Oklahoma. Christi Friesen will be teaching two half-day classes, plus we'll have demos, vendors, food, and plenty of space for claying. I'm particularly excited about our goody bags, since I've been in charge of finding donors for those (they're gonna be filled to the brim with great stuff!). If you're in the middle part of the country — or have been looking for an excuse to visit Oklahoma (and who isn't?!) — I hope you'll consider registering for our retreat. I'd love to meet you!